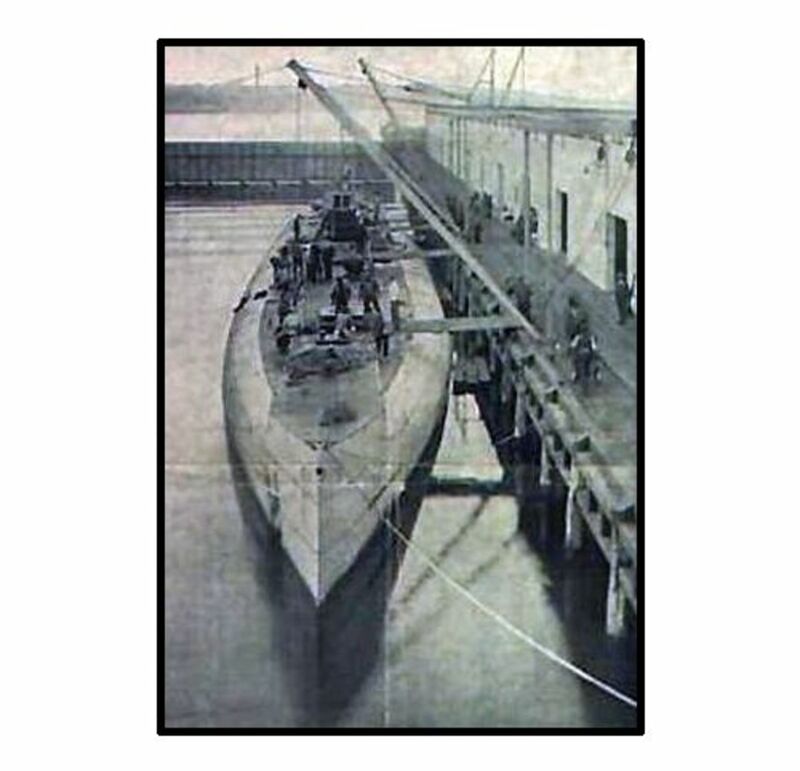 World War 1 History: 1916—German Merchant U-Boat Arrives in U.S.
On July 9, 1916, during World War One, the unarmed German U-Boat Deutschland docked in Baltimore, U.S., loaded with 750 tons of valuable cargo and seeking to trade for scarce materials needed by German war industries. 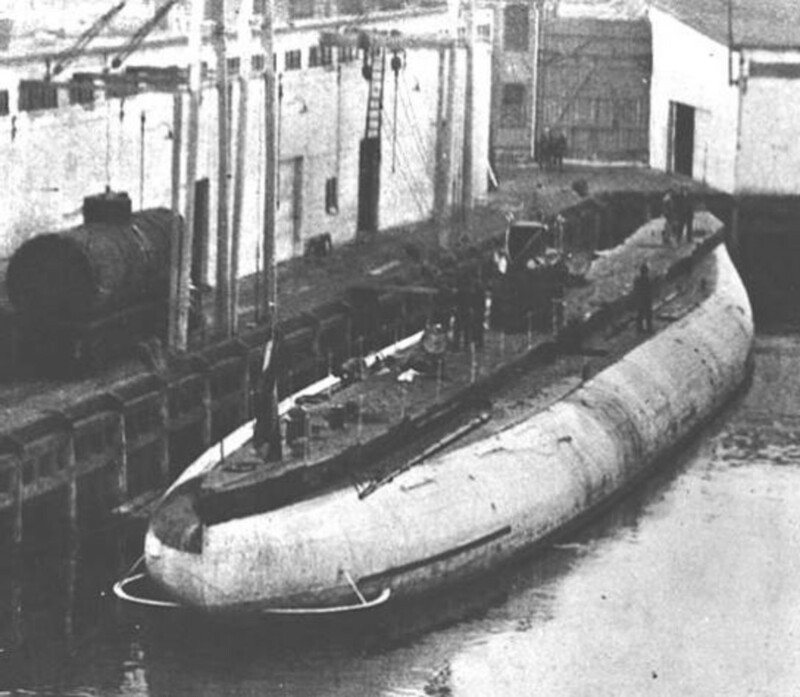 The Deutschland, oversized and with a much larger range than the attack submarines prowling the Atlantic, was specifically built as an unarmed merchant submarine to carry cargo long distances and evade the British naval blockade of Germany. 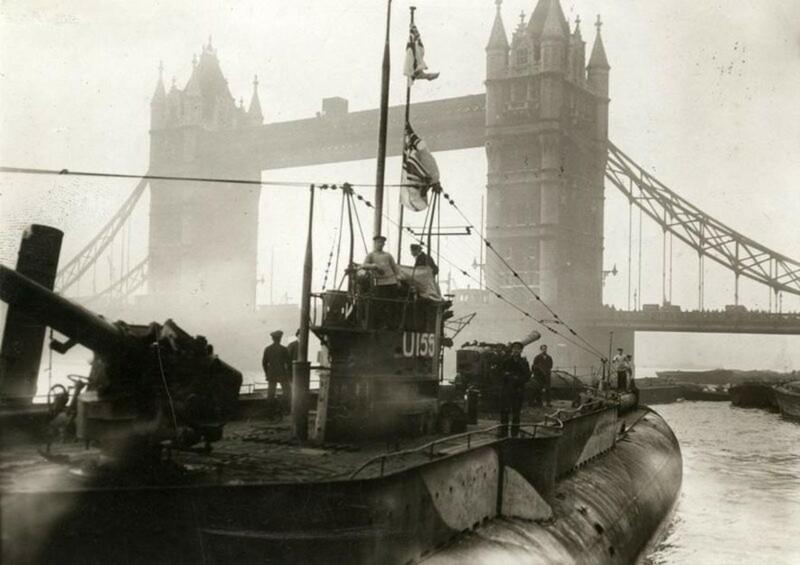 The Deutschland was the first of two purpose-built merchant submarines by a private consortium of German businesses with the sole purpose of conducting trade despite the iron grip of the Royal Navy's near-total blockade of Germany's coast. She was over 200 feet long and displaced nearly 2,300 tons (almost twice the tonnage of the largest military ocean-going U-Boats). She could carry 750 tons of cargo and had a range of 12,500 miles; her top speed was 17 mph while surfaced and 8 mph submerged. Because she could stay submerged for a long time, the Deutschland's relative slow speed was not a problem. Belligerent Warship or Unarmed Merchant? Since she had such a limited cargo capacity, the Deutschland was loaded with 750 tons of carefully considered goods: valuable chemical dyes, medicinal drugs, gemstones and mail, worth about $1.5 million. 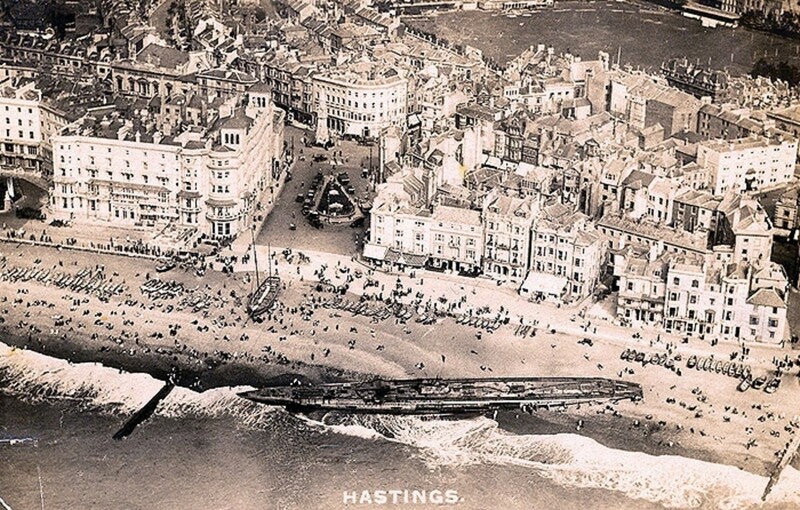 On June 23, 1916, she slipped under the surface and navigated the English Channel without incident. 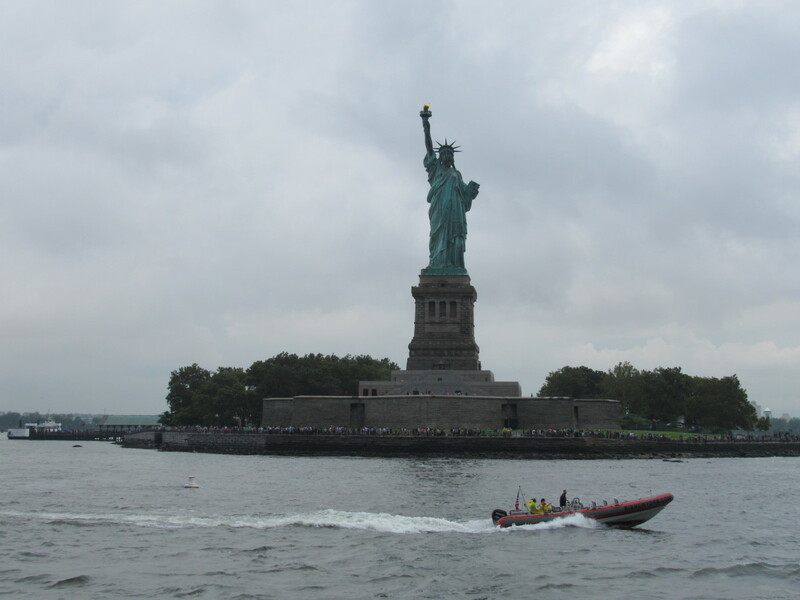 Just over two weeks later, she appeared, to the astonishment of all, in Baltimore's harbor on July 9. The Allied belligerents immediately demanded that the Deutschland and her crew be interned as a belligerent warship, since a submarine, even unarmed, could not be readily identified or its cargo inspected for contraband. The U.S., officially neutral at the time, rebutted that the Deutschland, being an unarmed vessel, could come and go as she pleased. It is believed that the German government pressured the U.S. to honor their neutrality, which many times before had been slanted in favor of the Allies. 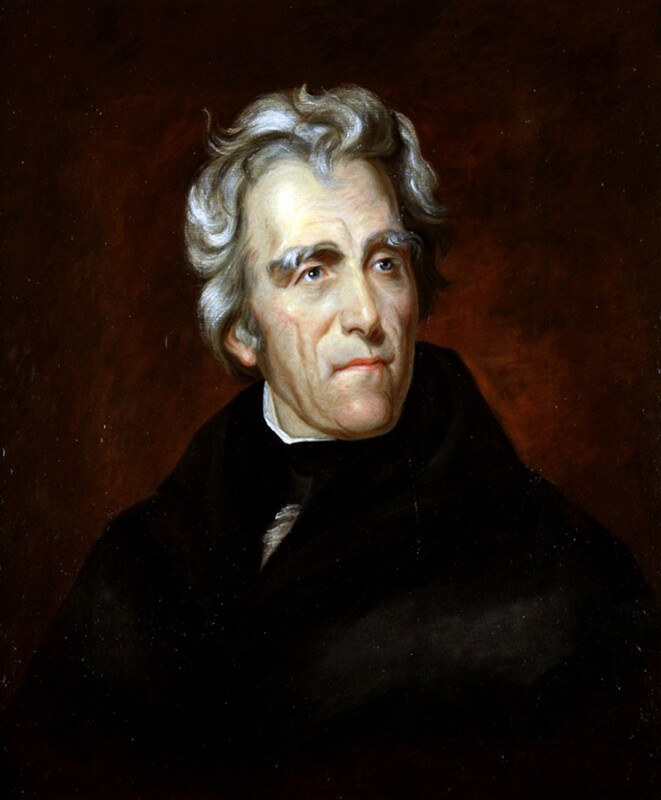 The twenty-nine officers and men were regaled as celebrities and attended several dinners in their honor during their three-week stay in Baltimore. She sailed on August 2, loaded with 350 tons of nickel, 100 tons of tin and 350 tons of crude rubber-- 250 tons of which were carried outside the pressure hull. She arrived back in Germany on August 25, 1916 and her cargo was dispersed to German war industries, supplying them for several months. The profit from the trip was $17.5 million dollars, nearly four times what it cost to build the Deutschland. In November 1916, she made another trip to the U.S., this time to New London, Connecticut. This time the cargo included gems, securities and medicinal products and again, she evaded the British blockade without incident. After unloading and taking on supplies and cargo for the homeward journey, including 6.5 tons of silver bullion, the Deutschland collided with and sank a tugboat. Five on the tug died and the submarine spent a week getting repaired. On November 21, she again set sail for home. It was her last trading mission. 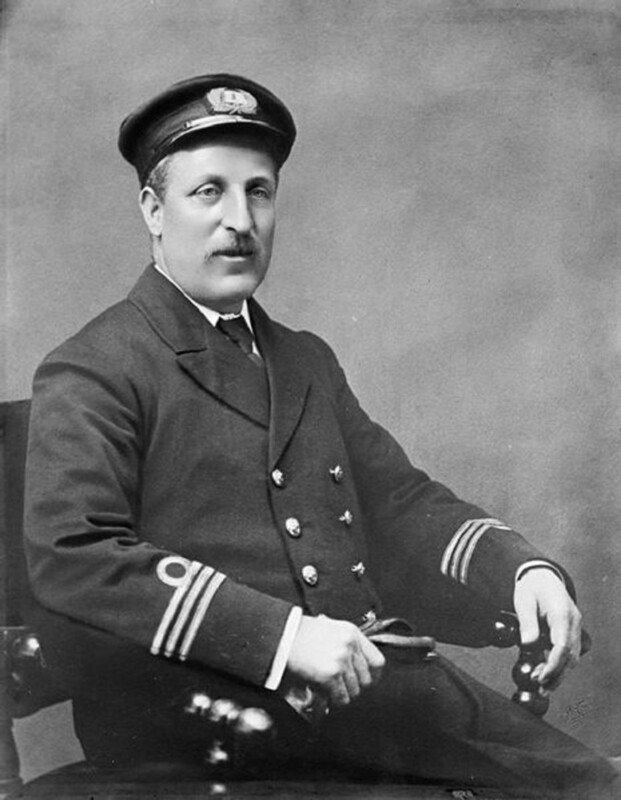 By the end of 1916, due to the British naval blockade, a typical German daily food ration was: five bread slices, half a small cutlet, half a glass of milk, two small dollops of fat, some potatoes and an egg cup of sugar. After the Deutschland returned to Germany, her sister ship, the Bremen, started her maiden voyage to Norfolk, Virginia, but she never arrived. Various theories were put forth as to what happened, from being sunk by an Allied sub to hitting a mine, but her fate remains unknown. In any case, relations with the U.S. were worsening-- especially regarding German U-Boats starting to hunt in international waters just off the northeast coast-- and a third trip by the Deutschland to the U.S. in January 1917 was aborted. The German Navy took over the Deutschland and converted her into a U-Kreuzer-- a submarine cruiser-- and designated as the U-155. At this time, the German Navy was in the process of converting or building six other submarine cruisers based on the merchant submarines. The Deutschland was fitted with torpedo tubes and two 150-mm cannons, much larger than the single 88-mm cannon typically outfitted on U-Boats. This was possible because of her much larger and sturdier beam (width). The idea was she would perform, literally, like a submersible cruiser. 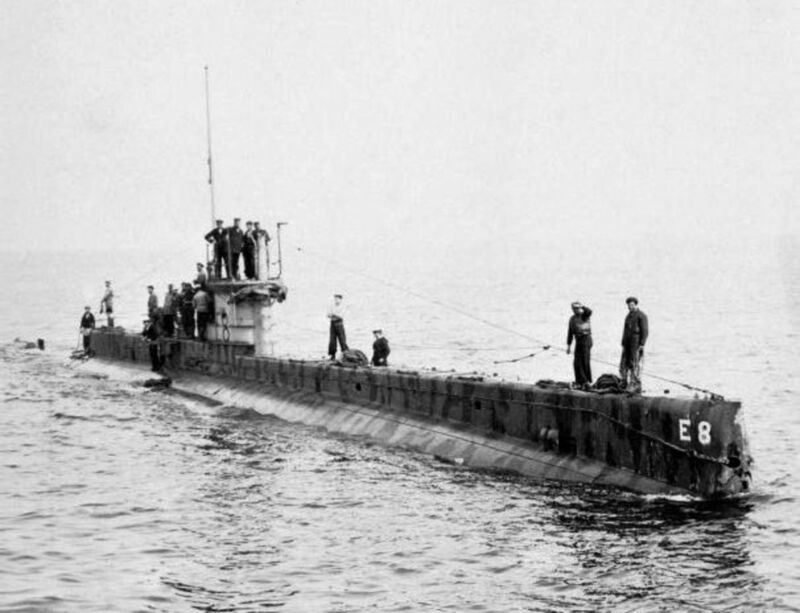 In her capacity as a U-Kreuzer, the Deutschland made three war cruises, one in 1917 that lasted 105 days and covered more than 10,000 miles-- one of the longest submarine cruises of the war-- and two in 1918. She sank 43 vessels, nine of them armed merchant ships, before returning after her third cruise to Germany on November 12, 1918, the day after the Armistice took effect. 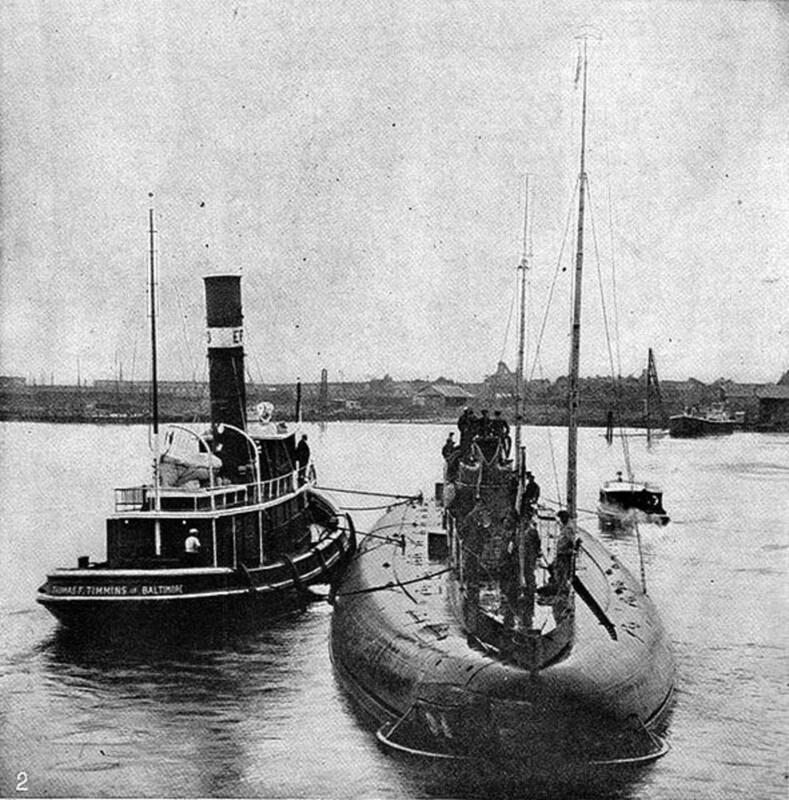 Under terms of the Armistice, she was surrendered and the British towed her up the Thames and exhibited her in London. In 1921, the Deutschland was sold for scrap and, while being broken up, exploded, killing five. If Germany was believed to have sunk the Lusitania with significant loss of American lives, why was it allowed to dock in Baltimore? Great question. The Lusitania was sunk in May 1915 and, while there was outrage in America and Britain, American sentiment for war was still low; it would take two years before America declared war on Germany. American pressure did result in the Germans dialing back their submarine strategy somewhat. But the fact is the U.S. was not at war and, as a neutral nation, felt that they could trade with anyone. As a matter of fact, there was some resentment that the British blockade restricted American trade with Europe and Germany. As they say, war is a terrible thing, but business is business. Very good article. Common people are not Presidents or Kings or Royalty or Rich. We commoners need not become involved in war for there is no reward for us. Do not kill or risk being killed/injured. Avoid war on all levels. The article appears to imply, the only available raw Nickle supplies came from Sudbury Canada. Shipped to USA for refining, and then purchased by German war industry i.e. Krupp to harden steel manufactured to destroy Canadian soldiers and sailors....and the madness continues. Thanks much for your comment, Peter. I was trying to figure out what the sub reminded me of and I just figured it out-- a bit like a blowfish! But once militarized, it was a dangerous blowfish with two cannons instead of the normal one and each nearly twice as big as its smaller cousins. Excellent, well written and researched article on a little known method of transportation. Although our enemy you have to give credit to the Kreigsmarine for their resourcefulness. Thanks for commenting, Seregei. I'll email what little I have. It seems information on German merchant losses is very difficult to find, but I do have some links. Thanks a lot! Very impressive matter! Thanks for reading and commenting, MG. Glad you enjoyed it. Thanks for commenting, Just History. There's politics and, in this case, there was the Textile industry that may have had a say about those special dyes. A very interesting hub- I guess the neutrality of the Americans was always the issue. How the German government could protest and emphasise neutrality after the sinking of the SS Lusitania is beyond me- but there is the politics. Hi, Old Albion. Thanks for the comment; glad you liked it. I was intrigued by a picture of a sub that looked like a blowfish so started researching. When I saw one with two 150-mm cannons mounted, I knew I'd found another hub! I wonder what happened to the Bremen, I guess somebody somewhere was waiting. The Deutschland was a killer right to the end it seems. Another cracking hub UH, keep them coming. Thanks much, Man. Yeah... the Americans also didn't seem to learn much about about the sub menace period. Twenty-five years later, the Germans were back having their Second Happy Time sending ships along the East coast to the bottom for months before (already known-to-be-effective) anti-sub tactics were implemented (shameless Hub plug there). What a great read! You put in some good research. I never knew this information... But, I couldn't help thinking, "The Americans should have seized that ship at round 1." Also note the 5's, a number of death in the Bible. It's interesting. Thanks for commenting and voting up, TToombs08. Yes, I imagine things were pretty grim in such a small, confined space. 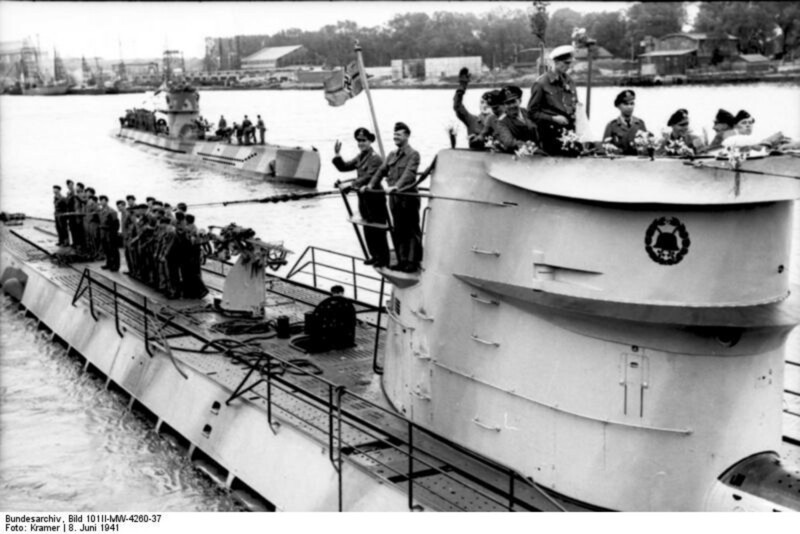 And while the concept of the undersea cruiser didn't really go anywhere, the Germans did develop their "milk cows"-- supply submarines-- for World War Two based on these merchant u-boats.